HKS LA Clutch (Light Action) combines accurate high level power transfer from engine to transmission while offering easy to use clutch feel which is particularly noticeable when the clutch is half engaged. Suitable for use on the streets or for sports use, LA Clutch is a single plate clutch which can support approximately 450ps (*1). 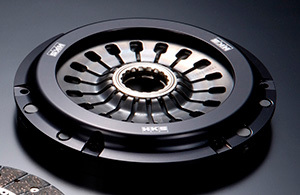 HKS LA Clutch is a complete set including clutch disc, cover and flywheel. The newly designed “MG Composite disc” developed to reduce juddering to enable the same driving feel as the stock clutch, yet with the capabilities of handling more power. 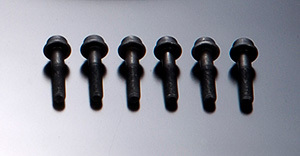 The disc damper also reduces impact and strain on drive train parts. New Material “MG Composite Disc” for ease of use and high toque transfer. 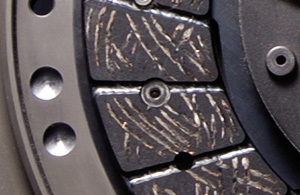 With a torque limit of 520Nm (53kgm) (*2), an approximate 450ps can be handled on this single plate clutch. Lightweight Flywheel, Lightweight Cover for improved acceleration and throttle response. 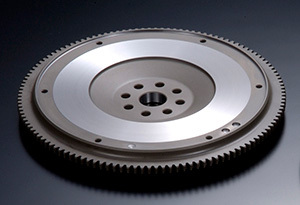 Lightweight flywheel reduces rotating mass for improved throttle response. Cover is made from a lightweight grade of aluminum meaning that the whole clutch assembly weight is approximately 80% (For Lancer Evolution) of stock clutch assembly. Disc, Cover, Flywheel in one complete “bolt on” set. Designed to be a simple bolt on fit even for pull type clutches, LA clutches come with disc, cover and flywheel for ease of fitting and peace of mind. “Strap Drive” allows for clean disengagement and high clutch input response. 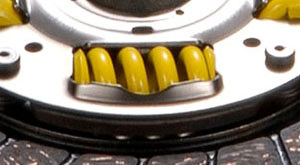 Disc damper reduces gear noise and protects transmission from impact torque.